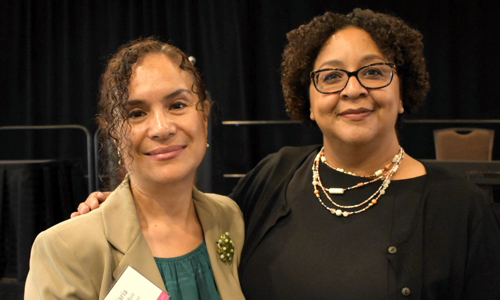 Maria Rocha-Ruiz, executive director of the UC Santa Cruz Educational Partnership Center, and Yvette Gullatt, vice provost for Diversity and Engagement and Chief Outreach Officer for the UC Office of the President. The award is given to two exceptional UC professionals who are chosen by colleagues in recognition of their individual commitment to improving educational opportunities for California students. Like Doby, recipients “demonstrate an unwavering dedication to student access, advocacy and social justice, whatever the length of their tenure at UC.” Winston C. Doby dedicated his career to increasing student diversity and access at UCLA and throughout the University of California system for more than three decades. This year’s other recipient is Penny Edgert, executive director of the Intersegmental Coordinating Committee. “I have long known that Maria is a superstar of our campus and the region,” said Richard Hughey, Vice Provost and Dean of Undergraduate Education. “Her efforts working with hundreds of middle schools and high schools within three counties are continually making lasting impacts not just on the students they work with, but also the schools and communities in Maria’s and the Educational Partnership Center’s collaborations. Rocha-Ruiz joined UC Santa Cruz in 2006 as assistant director for Pajaro Valley GEAR UP, part of the Educational Partnership Center. By 2013, she was appointed executive director of the EPC, where she oversees ten academic access and preparation programs. Rocha-Ruiz grew up in Castroville in a low-income, migrant, farm-working family. She was one of two Mexican American students from her high school who attended a four-year university upon graduation and was the first from her immediate and extended family to not only graduate from high school but also pursue a college education. While in high school, neither counselors nor teachers spoke to her about going to college or saw that she had the potential to attend an institution of higher learning. Fortunately, she liked challenging herself and, as a result, stayed on track with her “A-G” courses. During the summer prior to her senior year, she participated in a program called “Yo Puedo,” a four-week residential program at UC Santa Cruz through the Monterey County of Education (MCOE) Migrant Services, which changed her trajectory. Program staff spoke to her about college, and she met college students that came from a similar background as her own. Rocha-Ruiz attended UC Santa Cruz and earned a BA in psychology. From that first year in college until present day, she’s maintained her passion and commitment to ensuring students like herself are informed that they have the potential to pursue a postsecondary education, believe that they can achieve any goals that they set for themselves, and are resolute to never let others tell them otherwise. She has been a speaker at several functions delivering this message, including for her alma mater and the MCOE Migrant Services. Rocha-Ruiz has nearly three decades of experience designing, implementing, managing, and evaluating programs that primarily serve low-income, underrepresented students. Her career in outreach began as an outreach coordinator at San Jose State University. Six months later, when the program moved to California State University, Monterey Bay, she was promoted to assistant director. After six years in that capacity, she served for seven years as coordinator of community services for the San Mateo- Foster City School District. In 2006, she joined the UC Santa Cruz Educational Partnership Center (EPC) as assistant director for Pajaro Valley GEAR UP. The following year, she was promoted to director of GEAR UP programs in Pajaro Valley and North and South Monterey Counties. In 2013, she took the reigns as executive director of the EPC, where she oversees ten academic access and preparation programs. Rocha-Ruiz has been successful in acquiring more than $31.6 million in grant funding for the EPC for improving high school graduation and college enrollment and attainment rates for low-income and historically non-college-going families in Monterey, Santa Cruz and Santa Clara Counties. She earned a master’s in public administration from the University of Southern California. Past award recipients from UC Santa Cruz include Ebony Lewis (2014), who is now the admissions director at UC Davis, and professor emerita Catherine R. Cooper (2017).